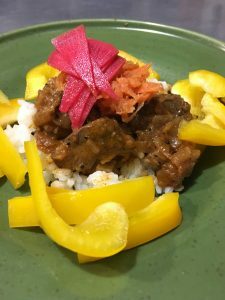 Short-grain rice, Sri Lankan beef curry, Thai carrot salad, my friend Kat’s watermelon radish quick pickle, and some sliced bell pepper. 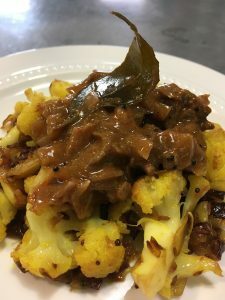 Yummy — I especially like how the pickle enhances the spiciness of the beef curry. Also, it’s ridiculously pretty. 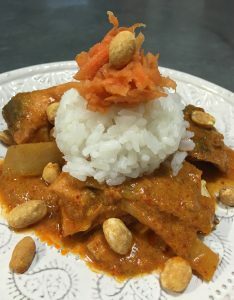 No real recipe — I just follow the instructions on the Maesri red curry paste can, combining the paste with coconut milk and a bit of brown sugar and fish sauce and simmering the salmon and bamboo shoots in that. But I had fun building the tower for my dinner. 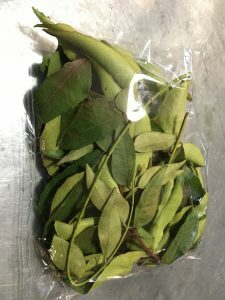 I was excited to hear that you can buy fresh curry leaves by mail on Amazon now — I had to try it because even though I have a little curry tree at home that I pick from, I’m constantly hearing from people who want to make my recipes and can’t find curry leaves locally. I’m glad to report that these are just fine. 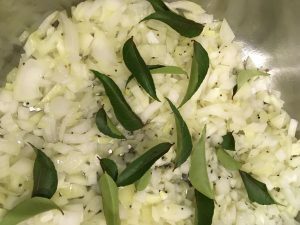 They’re not the strongest curry leaves ever — you might want to double the amount for full flavor. But they certainly work. 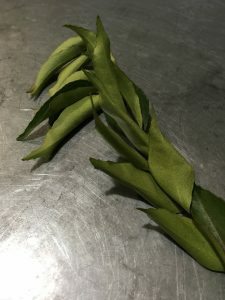 I threw one stalk into a beef curry, and since I’m not making curry again for a few days, put the rest of the bag in the freezer, and will pull more stalks out as needed. This is one ounce’s worth, sold by Monsoon Spice Company. Okay, this is slightly tricky, since you need to cook it in two batches, but a) tasty, b) nutritious, and c) pretty! 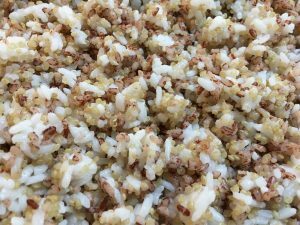 I cooked a mix of red rice and quinoa in the rice cooker (on the brown rice setting, which is very slow, so allow extra time). And then cooked some short-grain white rice also in the rice cooker (faster). And then mixed them all together. Yum! Nutrition comparison below (based on quick googling). This was a fun one for me — an entirely vegan dinner, that I did for last week’s board game night. Pretty easy with Sri Lankan food. 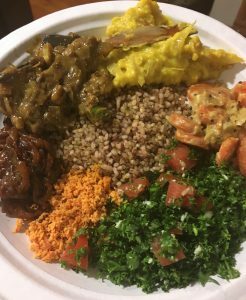 Going around clockwise: lentils in coconut milk (tons of protein), carrot in coconut milk, kale sambol, coconut sambol (spicy), seeni sambol (spicy and sweet), eggplant curried in coconut milk, with red rice / quinoa in the center. 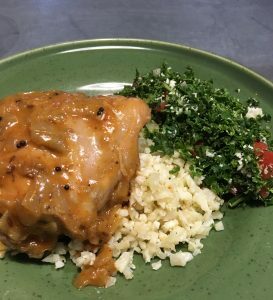 If I were doing it again, I’d make more of a bed of red rice / quinoa — I had to go back for seconds on that to happily eat the rest, get the balance right in each bite. 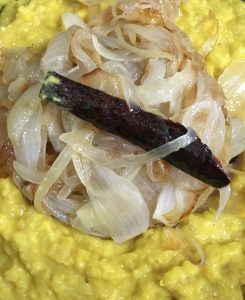 And I’d dice the onions for the lentils instead of slicing them — they were a little too noticeable when paired with the sliced onions in the seeni sambol. This was plenty of food for the number of people we had, but for a larger dinner party, you could expand the plate’s options. I’d add papadum for crunch, probably some lime-masala mushrooms for the tang. Devilled potatoes would add a luscious spicy-tomato element, though you could also just add tomatoes and potatoes to the eggplant curry for similar effect. Cashew curry or chili cashews would add another hit of protein in rich, nutty form. And while I’ve never had a raita without yogurt, I wonder if you could do something similar with coconut milk, for another cold element. 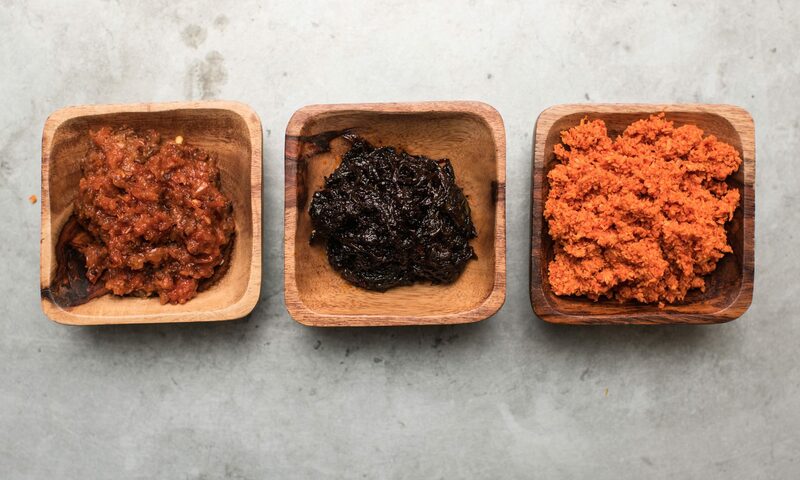 Proper balance of varied flavors for a Sri Lankan dinner party is an art form! But making it vegan was no more difficult than vegetarian or with meat, it turns out. 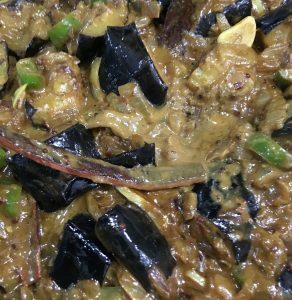 My mother’s eggplant curry was always a huge hit at Sri Lankan dinner parties, and is particularly popular with vegetarians. 1. Prep eggplant — rub with turmeric and salt and then set in a colander to drain at least 30 minutes, which will draw out the bitter water. Blot dry with paper towels. 2. 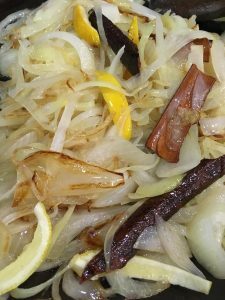 Sauté onions in oil on medium-high, stirring, with cumin seed, black mustard seed, and curry leaves, until golden. 4. Add coconut milk and simmer for a few minutes until well blended. 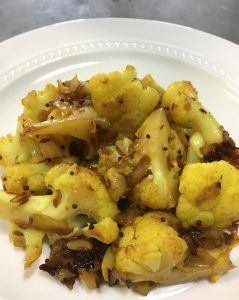 Serve hot with rice or naan—particularly nice for a vegetarian dinner with lentils as the main protein. Variation: Eggplant and bell pepper work well together in this dish; just add chopped bell pepper about five minutes into frying the eggplant for a nice sweet element to the dish. Sometimes I make a nightshade curry, adding potatoes and tomatoes as well — small cubed potatoes would go into the onions first, then eggplant and spices, then bell pepper, then tomato, with a few minutes between each addition. NOTE: I was wanting something a little spicier, so this time I added some chopped green jalapeños when I added the eggplant. Yum. 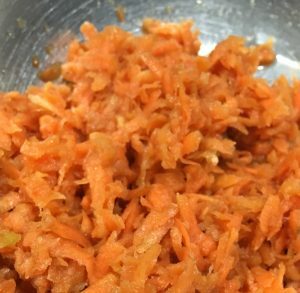 The experiments continue — tried cauliflower ‘rice’! I wouldn’t say I like it as well as rice, but it’s pretty okay, esp. 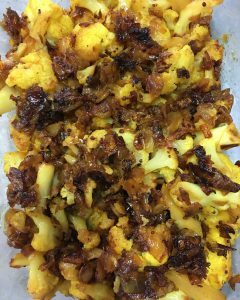 if sautéed with a bit of ghee first, and served with a nice chicken curry and kale sambol. Feels more culturally appropriate for Sri Lankan food than shirataki, certainly.